The hydrogen atom may hold surprises yet to come. On the other hand, perhaps the greatest surprise would be none at all. The time scales of human experience—hours, months, or decades—provide no mental hooks to grasp either the meaning or the significance of the age of the universe: 15 billion years. Even the time contained in a millennium is not easy to grasp. To identify the age of the universe as 15 million millennia doesn't really help. In the face of this conundrum, it is astounding that events occurring some 15 billion years ago have been described theoretically by big bang cosmology and have been validated experimentally by means of direct observations and laboratory-generated data. The abundance of deuterium, quasars, and microwave background radiation are three empirical pods that endow the big bang theory with intellectual plausibility. As a result, big bang cosmology has the support of most contemporary scientists. In sound science, however, a good theoretical framework like big bang cosmology invokes nagging questions and poses inviting puzzles. For example, where is the antideuterium? More generally, where is the antimatter? At the microscopic level, that is, the level of fundamental particles that make up the Earth, Sun, and Milky Way, all evidence points to a clear symmetry between matter and antimatter; yet, on the macroscopic level we observe an asymmetry—matter dominates the cosmos. Why should this be? Did the big bang produce equal amounts of matter and antimatter and Earth just happens to reside in a portion of the universe where matter holds sway? In our local cosmic environment we know with full confidence that matter dominates. Matter clearly is the stuff of the toasted cheese sandwiches we enjoy. But beyond lunchtime cuisine, the weight of accumulated evidence suggests that the universe consists of matter, only ordinary matter. For example, while the Earth is bombarded by cosmic rays consisting of particles from space, individual antiparticles are not observed nor are the simplest composite nuclei such as an antideuteron or an antialpha particle ever seen. If antimatter was present in other parts of the universe, there would be antinuclei and antiatoms in those regions. One might expect that, among the cosmic rays raining in on the Earth, there would be an occasional antiparticle of some kind. Antiparticles have not been observed in cosmic rays. Also, if there were concentrations of antimatter in the universe, one would expect to observe a background of gamma radiation emanating from those localized spatial regions in between the matter and antimatter domains. Such gamma rays would result from the annihilation that occurs when particles and antiparticles meet. However, spatial regions emanating gamma radiation are not observed. So the lack of evidence to the contrary suggests a universe made up of matter. The absence of antimatter only spurs more questions. Why did the big bang elect to serve up matter rather than antimatter? Or did the big bang create both matter and antimatter, but in slightly different amounts so that when particles and antiparticles annihilated each other, there was a residue of matter remaining that, after 15 billion years of expansion, makes up the current universe? There are plausible answers to these questions, but the answers are laced with speculation and uncertainties. Speculation is not always unproductive, however. Today's provisional answers are likely to be present in tomorrow's facts. Physicists currently understand the asymmetry between matter and antimatter in terms of reasoning based on a conservation law and a symmetry principle. If physicists were asked to rank physical principles in terms of their importance, symmetry principles and conservation laws would be prominently located at or near the top of the list. Curiously, both one conservation law and one symmetry principle must be violated in order to provide an answer. The violated conservation law is the conservation of baryon number. Baryons are a class of particles and their antiparticles that include the familiar proton and neutron. There are more massive and less familiar baryons as well. Baryons are given the number +1 and antibaryons the number — 1. The conservation of baryon number states that any process involving baryons can occur as long as the baryon number stays the same; that is, the total baryon number before the process must equal the total baryon number after the process. If the big bang produced exactly equal amounts of matter and antimatter and if the conservation of baryon number held precisely, the particles of matter and antimatter would annihilate each other and there would be nothing left in the universe except the background radiation—no galaxies, no stars, no planets, no Picasso. So, the reasoning goes, there must be a slight breakdown in baryon conservation. Actually, a very, very slight breakdown. The relatively massive proton owes its stability to the conservation of baryons. In general, massive particles are energetically unstable. To achieve greater stability they decay into less massive particles. An isolated neutron, for example, has a mean lifetime of 896 seconds before it decays into a proton and an electron. The less-massive proton and electron are energetically more stable that the more massive neutron. The proton could conceivably decay into a positron and a neutral pion, but in so doing, the conservation of baryon number would be violated. But is the proton absolutely stable? Is baryon conservation absolute? The proton has an experimentally established lifetime on the order of 1030 years, which is about 1020 times older than the universe itself. Right now experiments are ongoing in which detectors surrounding some 1030 protons are patiently waiting a signal that would indicate the decay of a proton. One proton decay would give the magnitude of departure from baryon conservation. One proton decay would open the way for a universe of matter. (The status of baryon conservation is a bit suspect because an external observer cannot distinguish between a black hole of matter with a positive baryon number and a black hole of antimatter with a negative baryon number. This means that baryon conservation cannot be as deeply significant as charge conservation.) Along with a slight breakdown in baryon conservation, a symmetry principle must be violated. If the laws of physics retain their validity when a system is observed from different points of view, a symmetry principle can be identified. One symmetry principle called parity, P, states that the laws of physics retain their validity whether one looks at a system directly or looks at its mirror image. Look into a mirror: raise your right arm and salute your image. Your image is seen saluting back, but with the left arm. Mirrors exchange handedness: right for left and vice-versa. The parity symmetry says that nature makes no absolute distinction between right and left, that a process and its mirror image are described by the same physical laws. Physicists believed that P symmetry held absolutely until 1957, when Chien-Shiung Wu and her coworkers1 and, independently, Richard Garwin, Leon Lederman, and Marcel Weinrich2 showed by different means that P symmetry was violated. The demise of the parity principle brought down another symmetry principle that goes by the awkward name of charge conjugation. This principle, C symmetry, simply means that the same laws that describe a process involving matter will also describe the same process involving antimatter. In fact, however, the violation of P symmetry showed that physical laws can distinguish between matter and antimatter. Whereas both P and C symmetries are individually violated by nature, the combination CP invariance—the exchange of particles with their corresponding antiparticles followed by a reflection in a mirror—was thought to hold absolutely until 1964, when J. W. Cronin, Val L. Fitch, and colleagues showed that CP symmetry was violated in the decay of neutral kaons.3 This was the one and only violation of CP symmetry that had been observed until March 2001, when the decay of neutral B mesons also violated this symmetry. But these two violations mean that CP invariance is not absolute. With this violation of CP symmetry and with the possibility of baryon nonconservation, it is possible to explain why matter dominates the universe. The explanation, however, is speculative and not very satisfying. The symmetry principles C, P, and CP are not absolute. The symmetry principle CPT, discussed below, is regarded as absolute and is often referred to as the CPT theorem. This is where anti-hydrogen comes in. The antihydrogen atom exists; it has been observed. The hydrogen atom consists of a positively charged proton surrounded by a negatively charged electron. In the anti-hydrogen atom, particles are replaced by their antiparticles: the nucleus of antihydrogen consists of an antiproton carrying a negative charge surrounded by an antielectron, called the positron, carrying a positive charge. The first hint of the existence of antimatter emerged from a puzzling consequence in Paul Dirac's famous paper of 1928 in which he brought together the theories of relativity and quantum mechanics. After several attempts to understand this hint, physicists proposed the existence of a new particle exactly like the electron, except opposite in charge. 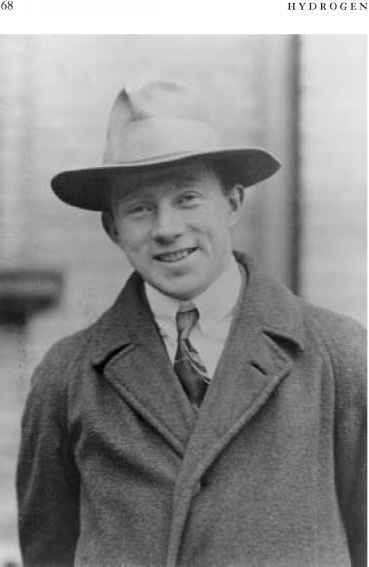 On August 2, 1932, Carl D. Anderson, working at the California Institute of Technology, photographed the first cosmic ray track that was made by a posi tron.4 Now positrons are routinely created in accelerator laboratories where they have been studied in great detail and have been used as both projectiles and targets for wide-ranging studies. The antiproton was discovered twenty-three years later in 1955 at the University of California, Berkeley by Owen Chamberlain and Emilio G. Segrè.5 The antiproton also can be made in accelerator laboratories and has been studied rather thoroughly. These two experiments verified that two components of antihydrogen exist, therefore antihydrogen itself must exist. The trick will be to make and assemble antihydrogen in sufficient quantities to subject it to critical study. Why study antihydrogen? Because hydrogen, in its antimatter form, provides the opportunity to test two bedrock principles of physics: CPT symmetry and the equivalence principle. Once again, the hydrogen atom begs the attention of physicists, who will look to it for enlightenment. The T in CPT symmetry implies that the laws of physics are valid (invariant) for either time moving forward or time moving backward. To apply CPT symmetry, one applies each symmetry in succession: exchange particles with antiparticles (C), exchange left and right (P), and exchange forward-moving time with backward-moving time (T). The same laws of physics are valid both before and after these exchanges. As discussed above, the CP symmetry is violated in two known cases; however, when T is added, the resulting symmetry, CPT, is an exact symmetry of nature. The kaon system that revealed a violation of CP symmetry is found consistent to a high degree of precision (a few parts in 1018) with CPT symmetry. CPT symmetry is deeply embedded in fundamental physics. One can prove that quantum field theory and special relativity (as we currently understand these theories) respect CPT symmetry. If CPT were to be proven invalid, contemporary physics would be scrambled. The equivalence principle is the cornerstone of general relativity. This principle states that the weight of any object is proportional to its inertial mass. This is quite amazing. A brick has an inherent property called its inertial mass; the brick's weight, which is in direct proportion to its gravitational mass, is a measure of the gravitational attraction between it and the Earth. The equivalence principle asserts that these two masses, inertial and gravitational, are identical. Does antimatter obey the equivalence principle? Simply put, physicists do not know. The antihydrogen atom puts both the CPT symmetry principle and the equivalence principle to the most exacting test now conceived. Before considering how this can be done, it is appropriate to consider briefly how the antiproton and the positron can be brought together to form antihydrogen. Dan Kleppner said in 1992 at a workshop in Munich, "in the past six years the creation of antihydrogen has advanced from the totally visionary to the merely very difficult. "6 Since 1992, the "merely very difficult" remains very difficult. As stated earlier, antihydrogen has been made: first at CERN in Geneva, Switzerland7 and a short time later at Fermilab in Illinois (see Figure 21.1).8 However, only a few antiatoms were produced and observed. The challenge now confronting experimentalists is first to make antihydrogen in quantity, next to bring the antiatoms together, and finally to hold them in isolation long enough for spectroscopy. 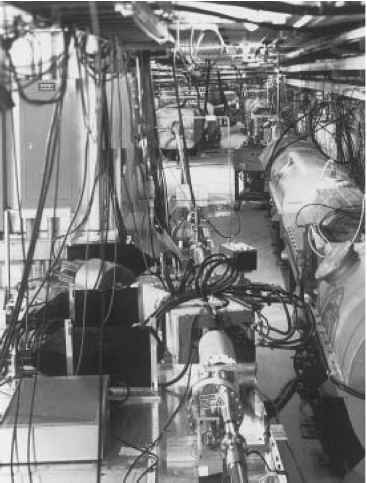 Figure 21.1 The experimental apparatus at Fermilab that produced the first antihydrogen atom. hydrogen should be identical. The incredible precision achieved in the study of the hydrogen spectrum has elevated quantum electrodynamics to the status of the most successful physical theory. The same precision achieved with antihydrogen could place CPT symmetry on a firmer footing. Both antiprotons and positrons emerge from the production process with relatively high energies—much too high to come together and form a docile antihydrogen atom. The first step toward an antiatom is to slow down these antiparticles to tepid speeds so that the electrostatic attraction between the antiproton and the positron allows them to embrace each other. After slowing, the next step is to bunch each of the antiparticles and trap them in a suspended cloud isolated from the walls of the apparatus. Then the clouds of antiprotons and positrons must be merged so that they can form antiatoms. All this presents experimental physicists with a daunting challenge, but they will eventually succeed. If this result is obtained, the CPT theorem will be confirmed; if the Rydberg has a slightly different value, a hallowed symmetry principle underlying basic physics will be thrown open to question. The spectral analysis of antihydrogen also suggests a way to test the equivalence principle. More than one method is being considered, but one of the more fascinating involves the seasonal changes in the gravitational potential of the Sun at the surface of the Earth. The distance between Sun and Earth varies throughout the year, leading to a change in the gravitational potential. What does this have to do with the hydrogen-antihydrogen spectrum? The link is Einstein's very famous equation, E = mc2. Because of the mass-energy equivalence, a hydrogen atom's mass includes a contribution from the atom's energy. An antihydrogen atom in a high energy state has more energy than it does in a low state. In turn, an atom in a high energy state is more massive than when it is in a low energy state. Further, when the atom is in a gravitational field, its gravitational potential energy is greater when the atom is in a high energy state. One consequence of general relativity is that the wavelength of a photon increases as the gravitational potential decreases. Thus, when an atom in a gravitational field emits a photon, the wavelength of the emitted photon is decreased in proportion to the potential energy. Does antimatter respond to gravity in the same way as matter? Throughout one year, the potential of the Sun at the Earth varies because of the eccentricity of Earth's orbit around the Sun. If the positron reacts differently to gravity than does the electron, then the frequency of the 1S-2S transition for antihydrogen would exhibit seasonal shifts different from the 1S-2S transition for hydrogen. If the seasonal shifts in wavelength (or frequency) are identical for both hydrogen and antihydrogen, the equivalence principle will be confirmed for both matter and antimatter. If the seasonal shifts are slightly different, it will open the possibility that matter and antimatter respond differently to gravitation. Symmetry typically prompts interest in an object and often endows it with beauty. The Gateway Arch in St. Louis, Missouri, poised on the western bank of the Mississippi River, has both symmetry and beauty. Its triangular cross-section is large at the base and gently tapers as it rises to its 660-foot rounded apex, forming a shape known as an inverted brachistochrone with bilateral symmetry. Symmetry also brings beauty and simplicity to physics. Symmetries are embedded in nature and the physical laws that describe the phenomena of nature have this same symmetry embedded in them. Symmetry, in turn, means that the laws of physics are invariant under the symmetry operation. For example, parity symmetry, P, implied that the same laws describe physical phenomena when right and left are interchanged. A violation of this symmetry was found that destroyed the absolute character of the right-left invariance. Steven Weinberg has a particularly provocative and charming way to describe the deep significance of the symmetry principles. He invokes the idea of rigidity.9 Some theoretical equations contain mathematical terms that can be adjusted to fit the data. Such equations have an inherent flexibility. By contrast, other equations are rigid. There are no ways to adjust them—they are logically rigid. The symmetry principles bring to physical theories a logical rigidity that not only endows such equations with a kind of beauty, but also an enormously enhanced credibility. When the equations emerging from a theoretical framework can be written in only one way and when these equations fit experimental data with exactitude, they must be taken seriously. In sum, symmetry brings rigidity and beauty to physics. The Gateway Arch has a stainless steel skin. As the light changes minute by minute, the arch captures and reflects light in ways that make it a living structure. Seeing the arch from different vantage points under different lighting conditions preserves the basic character of the structure because of its symmetry. In a similar fashion, the symmetry principles bring life and vitality to the physical laws of nature. And it falls on the simple hydrogen atom to provide the most strenuous test of these principles.